the local Incubator incubatore.net CSCS which is carrying on many mobility initiatives, among others the Erasmus For Young Enterpreneurs Project. 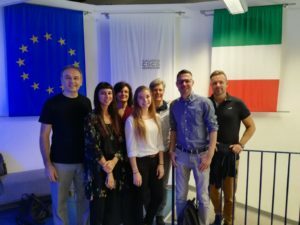 The tutors have arrived on the 13th September 2017 to monitor five students from BBS Wirthschaft 1 Ludwigshafen who are carrying out a traineeship at local enterprises in Pistoia with the programme of italymobility.com. BBS Wirtschaft 1 Ludwigshafen is a VET college which offers a wide range of vocational education and higher commercial courses, and its students are often employed as apprentices by the chemical company BASF. This is a very special year for the town of Pistoia cause it is the actual Italian Capital of Culture of 2017. The students and the tutors will, therefore, have the opportunity to take part in lots of cultural events, from live concerts to art exhibitions, as well as in many other tourist attractions and activities.